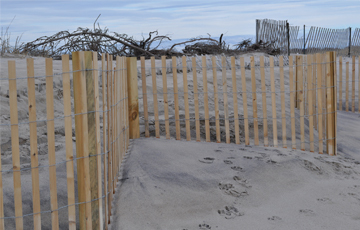 Sand drift fencing is actually inexpensive snow fence that is installed using 4”x4” green oak or pressure treated posts to hold the fence securely in place and that is arranged in a zig-zag pattern on the beach. As the wind blows up and down the beach, it blows through the slats of the fence, knocks sand particles out of the wind, and deposits them within the zig-zag of the fence. The build-up of the sand will take a few, and sometimes many, weeks depending on if the beach face is frozen, the time of year, or how steadily the wind blows. Over time, though, the amount of sand that can be accreted or accumulated can be several feet in vertical elevation, as can be seen from the attached photos. The beauty of sand drift fence accreted sand is that it is “free.” There are no borrow pit or trucking costs, the sand can build up to create a sacrificial dune in front of an existing dune, and if a large storm hits the beach, the sacrificial sand dune created by the sand drift fence will protect the native dune or resource area from erosion. 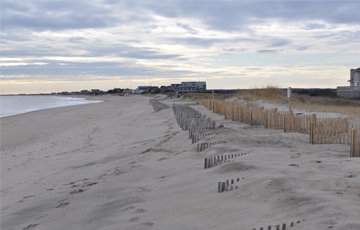 A wide beach is best for sand drift fencing, both in terms of beach face for the wind to pick-up sand and the set back from normal tides and surf. 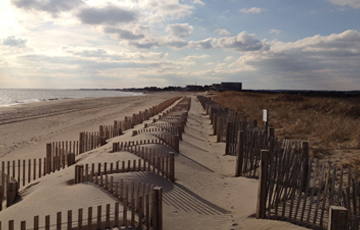 Sand drift fencing works during all four seasons. 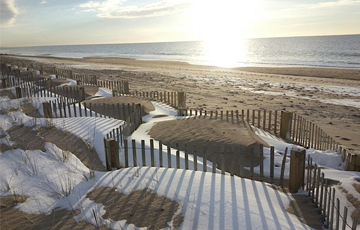 Some of the most impressive sand accretion that we have witnessed with sand drift fencing has come in the dead of winter- from December through March. 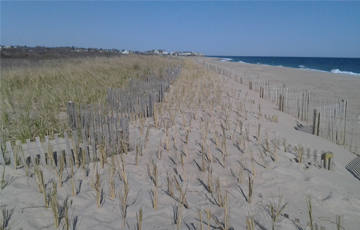 For assistance in determining if sand drift fencing is an appropriate erosion solution for your beach, call NETCO at 781-863-6270. 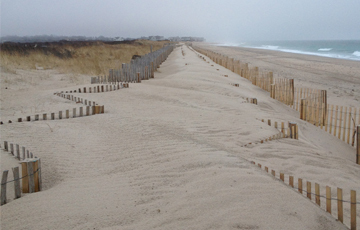 We have more than 15 years of experience in the installation of sand drift fencing, and in other solutions to dune, beach, and coastal bank erosion.